Don’t get left out of your own BBQ. You don’t want to be the guy (or gal) standing alone by the grill, periodically mangling your meat to see if it’s cooked enough. iGrill keeps you connected to your guests and your grill. 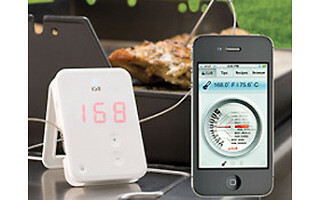 This Bluetooth enabled thermometer monitors the temperature of your food when you grill, bake or roast any type of meat. iGrill can work as a stand-alone thermometer -- just set your desired temperature and iGrill will beep when your food is ready. Or you can pair it with an iPhone, iPad or iPod Touch, and the iGrill app will send an alert to your device when your food reaches the desired temperature. In addition, iGrill comes with recipes, tips and advice, such has how to de-bone a fish. Created by inventor Chris Allen Sr., iGrill makes it easy to be a great host and a great cook. So stop hovering around the grill! Hi Daily Grommet Community. Welcome to iGrill, part of the Cooking Revolution. iGrill enables you to multitask between your grill or oven while mingling with guests. With peace of mind that your food is perfectly cooked, at target temperature and safe for consumption-- it puts you firmly back as the master of the grill and no longer the slave to it. My name is Jen, how can I help you? What is the maximum temperature the probe and wire can withstand? @Nancy: It sounds like you are thinking of something other than grilling! I will check with Jennifer and let you know. @Nancy: The probe can withstand temps from 40-400 degrees fahrenheit. The cord length is 48 inches. Don’t get left out of your own BBQ. You don’t want to be the guy (or gal) standing alone by the grill, periodically mangling your meat to see if it’s cooked enough. iGrill keeps you connected to your guests and your grill. 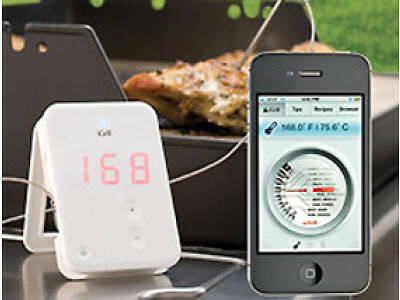 This Bluetooth enabled thermometer monitors the temperature of your food when you grill, bake or roast any type of meat. iGrill can work as a stand-alone thermometer -- just set your desired temperature and iGrill will beep when your food is ready. Or you can pair it with an iPhone, iPad or iPod Touch, and the iGrill app will send an alert to your device when your food reaches the desired temperature.